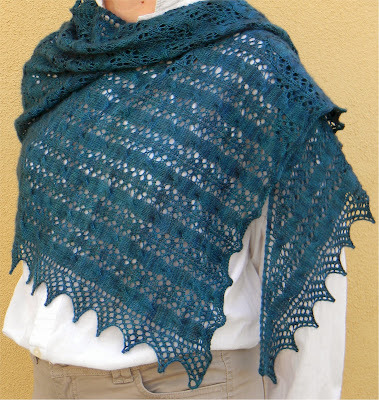 This scalene shaped shawl will remind you of paddling down the river, coasting along in the white, bubbling slipstream flow between rocks and over shelves into the quiet pools of deep peaceful blue on a sunny afternoon. Shown in Merino Light (color: cousteau) by Madeline Tosh. Note: For cast on and setup, I prefer to work on either short straights or DPN’s. It provides more control and less clutter, allowing you to establish your setup with more stability. Cable needle, tapestry needle for weaving in ends, and row counter may be helpful. Approximately 24 sts in pattern = 4” (10cm). Your gauge will vary depending on your yarn and needle choice.